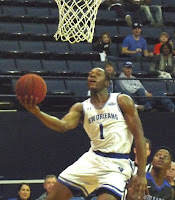 Down 19 points in the second half, the Privateers (3-8) rallied to within two with under two minutes left before falling 74-67 at Alabama Birmingham. New Orleans, which trailed 45-30 at the half, fell even further behind before beginning a rally that culminated in two Ezekiel Charles free throws to bring UNO within 69-67. Unfortunately, those were the last Privateer points of the night. Freshman Damion Rosser led UNO in scoring for the second time this year with 13 points. Travin Thibodeaux and Ezekiel Charles added 12. Charles continued to establish himself as a threat from deep, nailing three triples. The non-conference slate is over. New Orleans begins conference play in eight days with a home contest against Abilene Christian on December 28.